372 pages, 8.5" x 11"
The 1979 World Series champion Pirates are one of the most memorable teams in baseball history and helped define an era. One look at their pillbox caps—adorned with stars distributed by team captain Willie Stargell—or their typically garish uniforms, complete with striking yellow jerseys often worn with same-colored pants, and the viewer is transported back to the Steel City at the close of the 1970s. When Pops Led the Family celebrates this team and its cast of characters, including Willie Stargell, Manny Sanguillen, John Candelaria, and Kent Tekulve. Featuring contributions from 39 members of the Society for American Baseball Research (SABR), this book includes biographies of all of the players, members of the coaching staff, and some of the the front office, an in-depth season summary, and detailed game accounts from some of the most pivotal games of the season and all of the postseason games. Essays on Three Rivers Stadium, manager Chuck Tanner’s use of his bullpen, and the “We Are Family” Song help round out the volume. Contributors include: Phillip Bolda, Frederick C. (Rick) Bush, Alan Cohen, Warren Corbett, Rory Costello, Tom Crist, Dan Fields, James Forr, Gordon J. Gattie, Paul Geisler, Paul Hofmann, Rock Hoffman, Mike Huber, Bob Hurte, Michael Jaffe, Maxwell Kates, Norm King, Russ Lake, Len Levin, Mark Miller, Rod Nelson, Bill Nowlin, Carole Olshavsky, J.G. Preston, Richard J. Puerzer, Richard Riis, Eric Robinson, Thomas E. Schott, Richard L. Shook, Matthew Silverman, David E. Skelton, George Skornickel, Jon Springer, Wayne Strumpfer, Clayton Trutor, Nick Waddell, Joseph Wancho, Steve West, and Gregory H. Wolf. E-book: Click here to download the e-book version of When Pops Led the Family: The 1979 Pittsburgh Pirates for FREE from the SABR Store. Available in PDF, Kindle/MOBI and EPUB formats. Paperback: Get a 50% discount on When Pops Led the Family: The 1979 Pittsburgh Pirates paperback edition from the SABR Store ($15.99 includes shipping/tax). 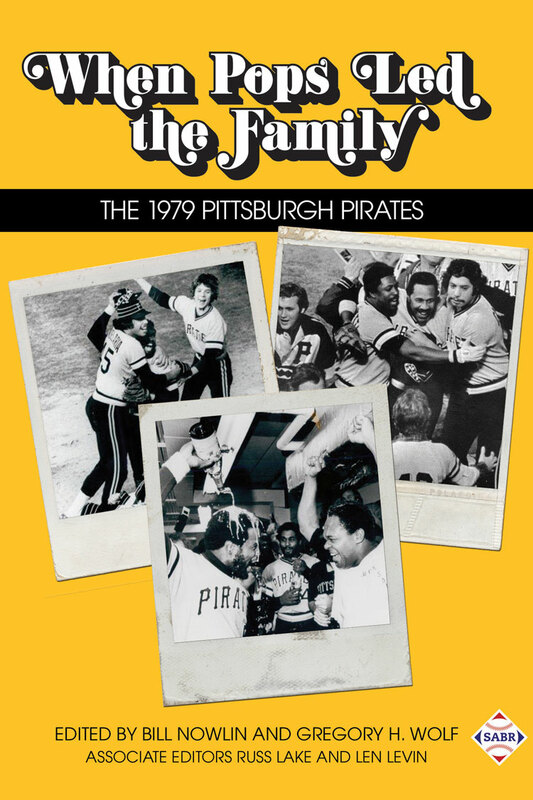 E-book: Click here to purchase the e-book version of When Pops Led the Family: The 1979 Pittsburgh Pirates for $9.99 from the SABR Store. Available in PDF, Kindle/MOBI and EPUB formats. Paperback: Get the paperback edition of When Pops Led the Family: The 1979 Pittsburgh Pirates from the SABR Store ($30.99 includes shipping/tax). For more than 40 years, SABR and its members have led the way in publishing the best baseball historical and statistical research. Our publications program is shifting to take advantage of new methods of publishing. Not only will we continue to publish new books like Can He Play? A Look At Baseball Scouts and Their Profession (released in December 2011); Opening Fenway Park in Style: The 1912 World Champion Red Sox (May 2012); Detroit Tigers 1984: What A Start! What A Finish! (December 2012); Sweet '60: The 1960 Pittsburgh Pirates (April 2013); Inventing Baseball: The 100 Greatest Games of the 19th Century (July 2013); Thar's Joy in Braveland: The 1957 Milwaukee Braves (May 2014); Detroit the Unconquerable: The 1935 Detroit Tigers (December 2014); Winning on the North Side: The 1929 Chicago Cubs (February 2015); Scandal on the South Side: The 1919 Chicago White Sox (June 2015); The Team That Time Won't Forget: The 1951 New York Giants (December 2015); Nuclear Powered Baseball/The Simpsons (February 2016), Au jeu/Play Ball: The 50 Greatest Games in the History of the Montreal Expos (April 2016); and Cuban Baseball Legends (July 2016), which showcase the best efforts of SABR's members, chapters and committees, but new technology makes it possible for us to bring out-of-print titles like Run, Rabbit, Run: The Hilarious and Mostly True Tales of Rabbit Maranville (February 2012), Great Hitting Pitchers (March 2012), Nineteenth Century Stars (August 2012); Batting (January 2013); The Fenway Project (September 2013); and '75: The Red Sox Team That Saved Baseball (April 2015) back again. This page was last updated October 31, 2017 at 3:59 pm MST.